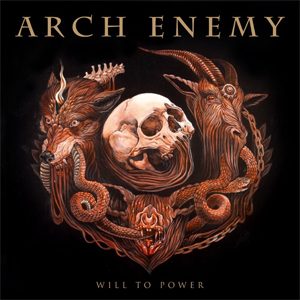 Metal powerhouse ARCH ENEMY are ready to bring their fierce brand of metal to audiences worldwide as they announce details on their upcoming album, Will To Power, out September 8, 2017 via Century Media Records. The band are excited to reveal the album's captivating cover artwork, as shown above, designed by Alex Reisfar. "It was a pleasure working with Alex Reisfar on the Will To Power cover artwork, he immediately grasped the concept and atmosphere we were looking for with this album. We talked about the double edged sword that is human ambition, how it can be outstandingly creative and beautiful but can also be turned into something dark and powerful. Alex proceeded to masterfully paint a strong image that evokes a lot of feelings. The human skull as a central focal point, the flesh sort of falling off into the circular pattern. The snake ouroboros weaving in and out of the mouths and throats of the severed heads of a wolf, a goat and a vampire bat... All representing self determination and a predatory, almost parasitic will to power"
Co-produced by Amott and drummer Daniel Erlandsson, the album was sent to long time collaborator and friend Jens Bogren (OPETH, AT THE GATES, DIMMU BORGIR) for mixing and mastering and marks legendary guitarist Jeff Loomis' (NEVERMORE) first recording with the band. Following in the steps of their most acclaimed album to date, War Eternal, which saw the band reach their highest charts in the US and Germany to date, Will To Power will continue to smash records worldwide. Having performed over 200 shows in more than 40 countries in support of their previous effort, ARCH ENEMY will continue fervently bringing their show to ever-growing audiences worldwide across the European festival market this summer. They are also excited to announce the first leg of their international Will To Power Tour 2017 which will commence from September 15 through October 11 across Eastern Europe and will feature special guests, JINJER. A full list of their upcoming appearances can be found below. There will be a US tour coming this fall as well. Stay tuned for further tour dates!